As we returned from our 10 day vacation to Mexico this December and walked out of the Dulles airport, I felt my bones freeze. Say what? I told my husband, I think I am turning around and catching the next flight back to Mexico. Now we are home, with the heating so high it seems we moved to the Equator. And I admit that the cold and especially the snow, which I am watching right this minute through my kitchen window starting to magically fall from the night sky, is one of the things I love about living in the Eastern United States. We can experience the full change of seasons. So instead of complaining, this is what I do: I take out my Piloncillo, or brown sugar, my bark of Ceylon or True cinnamon, some dark roasted coffee and make myself a Café de Olla. The Café de Olla is one of the most comforting things I can think of. Not only for when its cold outside. It is also wonderful to soothe the end of a rich meal or to start a cold morning with some cookies or toast on the side, or rather, dipped inside the coffee. It is called Café de Olla because for centuries it was prepared, and still is in some parts of Mexico and Mexican homes, in clay pots. Pot translates to Olla in Spanish, so that explains the funny translation to Coffee from the Pot. 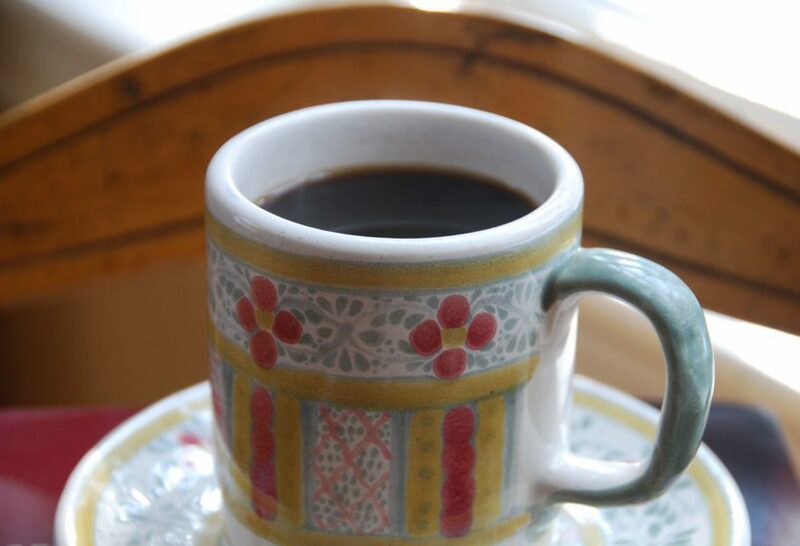 The clay pot imparts a peculiar earthy and deep flavor to the coffee. But if you don’t have a clay pot, that should not stop you from making it. The combination of coffee with piloncillo or dark brown sugar and cinnamon is extraordinary by itself as well. As I am gearing up for an exciting 2010 with fascinating topics to research and recipes to try and test for the next series of classes at the Institute, there is one thing I realize never ever changes in each single menu we offer: there is always Cafe de Olla after the end of the meal for our guests. Our regulars demand it. And me and my cooking team can’t start the day without it. With the spirit of continuing to welcome 2010, from my cooking team and myself -we have been so lucky to have been together for almost three years- we wish you a delicious 2010 filled with Café de Olla to warm your soul, your belly, your cold mornings and late nights. Heat water in a pot. When it comes to a rolling boil, lower the heat to low and add the coffee, piloncillo and cinnamon stick. Simmer for about 5 minutes, give it a couple stirs and turn off the heat. Let it sit covered for about 5 more minutes. Strain before serving with a fine strainer or cheesecloth. Or then again, pour into a french press, press down and serve. Pati, I just started watching your show and you are truly an inspiration to our culture! Do you have a recipe for a breakfast drink called ponche? I know it has egg, warm milk canela and sugar but do not know how to make it. It was a childhood breakfast. Aw thank you so much, Maria! I do have a ponche recipe: https://patijinich.com/ponche-or-my-moms-new-years-warm-fruit-punch/ but it is very different from what you are thinking of…. Prepared this recipe in a 100-cup coffee urn for a 60-woman “retiro” in October, held in Chapala, Jalisco, Mexico. They drained the urn dry, I added another 20 cups of water on top of the coffee ground, ramas de canela & piloncillo. Not a drop left!!! EXITO–gracias, Pati, for enriching our event and my life with this easy & adaptable recipe! That’s a lot of coffee, Lucinda…so happy everyone loved it so much! Hi Pati, if I buy a clay pit in a Mexican bazaar here in Texas. Is it ok to use it right away or does it have to be cured? Can you help me. Gracias…..
Ps, I just adore you and your show. To cure a clay pot you have to wash it with foamy warm water, rinse well, fill it with water and then set it over low heat and leave it there for hours… until all water evaporates. A bit laborious! I think I’m in love with you! I didn’t know how to make café de olla and I’m Mexican-American! I love coffee but brewing it with a coffee brewer just doesn’t taste the same and I’ve been looking for different types of coffees and still I can’t find that taste that I had when we would travel into Mexico. Now I know! I’m looking for a pot that will work with my induction heating stove top and of course the Mexican cinnamon sticks (hard to find where I live in Annandale, Va. aka Little Korea). I just ran into your show after looking for something to watch on TV. 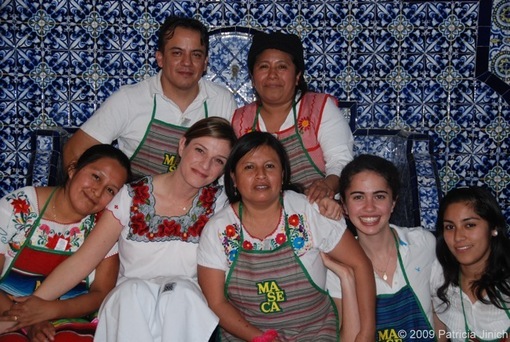 Love your show and I would like to travel to Mexico City to go eat at your father’s restaurant some day. I need the name of his restaurant too. Thank you. Be well, live well y que Dios la bendiga. I’m so happy you ran into the show! I hope you get to go to Mexico City soon…but my father retired and the restaurant is now under a different name and management. WOW!!! You are gr8 person/chef…i had been looking for the cafe de olla…absolutely love coffee…and this will be my favorite thing to end a cozy night..THANK YOU!!!!! You are so welcome, Linda! Thank you for your kind words! I just want to thank you for all of your recipes. They allow me to cook the foods that we love and reminds me so much of the foods my mother-in-law used to make when we visited Mexico. I hope you continue on your show of Patti’s Mexican TABLE. LOvery your show. Thank you Linda, Season 4 is coming out next spring! Want to let you know your shows have helped me cook the mealbs my husband and I love. Cafe De La Olla makes me feel like I am back in Mexico. I want to thank you for all of your recipes. I can enjoy the food I love. do you know of a recipe similar to this but using an egg that is vigorously whisked into the coffee to replace milk? My Mom used to do this. sus recetas,planeamos hornear tu cheese cake de cajeta,se ve delicioso,mi nino lo quiere con fresas. I just made this coffee using brown sugar, and it was delicious! I usually add milk to coffee, but this one didn’t need it. Thanks for the great recipe! My husband and I love your show! We saw the episode with the cafe de olla and are making it for the first time this morning. Thanks for the great recipes and your cheerful demeanor. Anytime one of us turns on your show or hears you on NPR, we happily yell, “Pati! !” and the other one comes running. Vanessa, thank you so much for your lovely message on this Sunday morning: you made me so happy! While visiting Spain, I enjoyed Cafe con leche, very much like this except no cinnamon. I have also taken a liking to adding Chicory, as much as 2 parts to 1 part coffee to cut the caffeine & help my high blood pressure. I think this is more Cajun the Mexican, but I like to mix things up a bit! Do they use chicory south of the border? David, I have not heard about this…. and ordered 2 lbs to see how I like it. I’m going to get some stick cinnamon to try. I use an espresso maker but have a French press too. I like to put Abuelita in the steamed milk. Pati, me ha dado un gusto enorme encontrarte en PBS. He vivido en este paÃ­s 14 años, aÃºn extraño lo variado de la comida mexicana, cocino lo que le gusta a mi familia y lo que sé, pero gracias a tus recetas podré seguir enseñÃ¡ndole a mis hijos toda la variedad de comida mexicana que existe. Lo que mÃ¡s me gusta de tu programa y tu blog es que las recetas son auténticas y no americanizadas. Quise escribirte en inglés, pero creo que es mÃ¡s apropiado hacerlo en español. Mucho éxito. Muchas gracias por escribirme y sobre todo en español Ana! I think it was on your show that I saw an easy way to peel fresh whole green chilies. I don’t remember how and was wondering if you could share it with me again. I watched your show for the first time today, and it was extraordinary! Thank you for sharing your recipes and especially the Cafe de olla, I’ve been looking for a way to make it since I enjoyed it in New Mexico last spring. Thank you for sharing your culture and your wonderful cuisine. Oh dear Patti, you almost brought tears to my eyes. In this fast pace’d world, some of us forget of the little things that mean a lot. On one of my days off, I was surfing my tv, and there you were making (cafe de la olla!!!!!!!!. Oh my gosh! All sorts of child hood memories came into my head!Patti when we were growing up, my parents would send my sister and I to my abuelitos house in mexico for the summers. 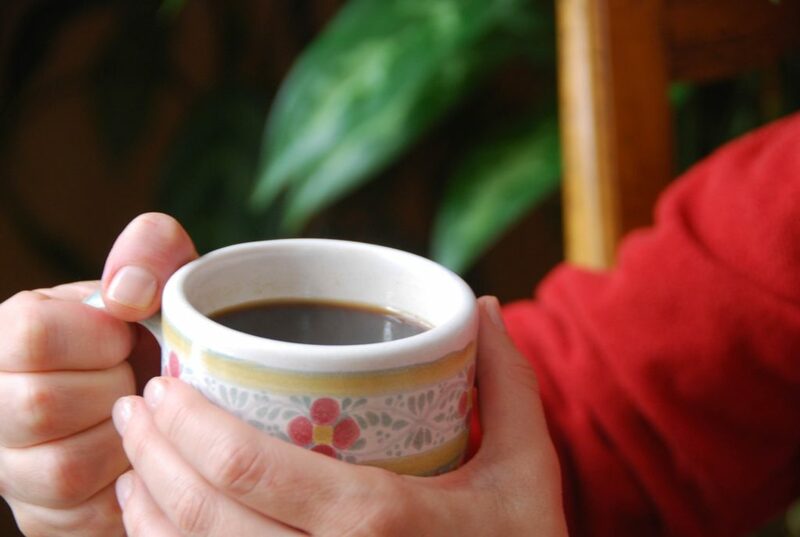 we would wake up to pots of (cafe de olla)everyday! At the time though not appreciating it. But I remember how penetrating the aroma was, that it would reach most of the bedrooms.This was a big ranch they had, many of my uncles worked the ranch,and this ritual would start at 4am.Her sons would come and pick up quart size looking containers,with homemade burritos,then go to work all day.when we’d wake up, abuelita would give us these little cups with cafe de olla,mostly with milk, but still tasting the richness of the coffee.I am now an adult,and had almost forgotten this taste, this aroma.Well now that I have your recipe,I make it at least 2 or 3 time a week. I take it to work once in awhile, and the workers really enjoy it. thank you patti for bringing our traditions back. Dolores, I can’t tell you how much your comment touched my heart. It is the best feeling to know that I am being welcomed into the homes of people that like what I like with this show! I am so excited that I was able to help stir some childhood memories. I hope you keep watching, and I hope the recipes continue to flood your memory with wonderful moments in time. Ayer por primera vez vi tu programa (vivo en Waxahachie,Texas); quede fascinada con tu seguridad y “carisma” al explicar las recetas. ! Con que gusto nos explicate la diferencia entre los tipos de canela !! (a todo le pongo canela)…Gracias por mostrarnos la cara Linda de Mejico (soy venezolana), sus costumbres y “sabores” . Aprecio mucho el valor de nuestras tradiciones!!! Exitos, ya no te perderemos de vista!! I will definitely be making this coffee when I go skiiing this winter. Or maybe this weekend, if I can’t wait that long. Congratulations on a wildly successful 2009. There is so much to look forward to in 2010, and so much to be thankful for, including you and the exciting flavors you bring to the year. Best wishes! Pati… that looks amazing!! I just found your site and I can’t wait to read everything here!